One of fall's hottest colors is "Biscay Bay," the deep teal color we've been seeing on the runway. Designers such as Christian Siriano and Monique Lhuilier have worked this vivid color into their fall pieces. Our Marrakesh Caftan is a great summer to fall transition piece you can wear year round. When the heat is on cool off in your caftan and palazzo pants. And as the fall temperatures begin to get lower, pair the top with jeans and boots. 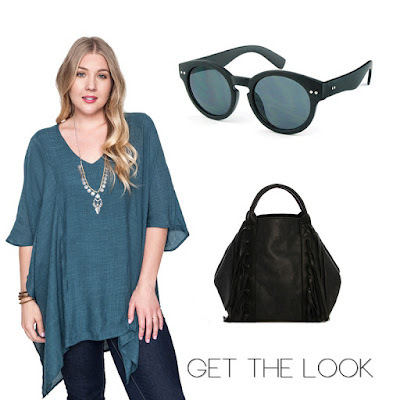 Grab your Jane Fringe Hobo and Kauai Round Sunglasses to complete the look. Get the look aboard the pink mobile boutique at an upcoming stop, or email info@lefashiontruck.com to have it shipped directly to you.